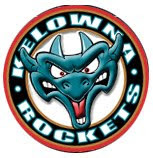 Kris Mallette walked gingerly off the ice Thursday night at Veterans Memorial Coliseum following the Kelowna Rockets 5-0 win over the Portland Winterhawks. Visually, it looked like he had won a thousand games in the Western Hockey League as a coach. No emotion outside of a small smirk on his face.Something tells me the assistant coach was doing cart wheels inside, though, after earning his first WHL coaching victory. In a rematch of last year’s Western Conference final, Mallette saw Jackson Whistle make 29 saves for his 6th career shutout and third of the season. Rourke Chartier scored twice while Justin Kirkland (1+2=3) and Austin Glover (0+3=3) each had multiple point games. Whistle’s 29 save shutout win was the first for a Rockets goalie on the road since February 25, 2011 when Adam Brown made 27 saves in a 1-0 victory in Red Deer. The shutout also snapped a streak of 198 consecutive home games for the Winterhawks with at least one goal. The Rockets opened the scoring just 51 seconds into the game, but the Winterhawks had the better scoring chances in the opening period. The fact remains, Jackson Whistle was far superior to his counterpart Bolton Pouliot at the other end of the ice. The Winterhawks had two power play chances in the first period and manufactured several quality chances on net, but thanks primarily to Whistle, the home team found themselves down 2-0. While Justin Kirkland’s goal with 7 minutes left in the first period made the score 2-0, it was one Pouliot should have stopped. It wasn’t the back breaking goal, but a veteran goalie has to make that save. A soft, low shot on the ice to the short side took a lot of momentum away from the Winterhawks, who at that point of the game deserved a better fate. Chase De Leo, Oliver Bjorkstrand and Nic Petan were used a ton over the first 40 minutes of the game. The teams’ top three players get a regular shift, see power play time and even contribute on the shorthanded unit. While that’s all well and good, using those players too much can prove to be fatal, specifically if you don’t have the lead. The Winterhawks had little pushback in the third period once the Rockets built up a 3-0 lead. You have to give the d-pairing of Cole Martin and Joe Gatenby a lot of credit for keeping the Winterhawks top line at bay. Rourke Chartier had a two goal game and now has four multiple goal games this season. All four multiple goal games, oddly, have come on the road. Austin Glover had three assists last night giving him 15 points in 13 games this season. Glover now has more points than he did in the last two seasons combined. Because of injury, Glover played in just 55 games the last two seasons, accumulating 12 points. Of Glover’s 15 points, ten have come on the road. Tyson Baillie snapped a five game goal scoring drought with his 11th goal of the season. I was looking forward to watching the match up featuring draft eligible Nick Merkley vs. Portland's Paul Bittner, but like the game, it didn't materialize into much. Merkley was the more dangerous of the two but managed just one assist. I thought Bittner was a stud last season and played a significant role in knocking off the Rockets in last years Western Conference final but he played a rather quiet game. Re-match of last years Western Conference final!! Tonight’s Preview: It is a rematch of last season’s Western Conference championship series as the Kelowna Rockets visit the Portland Winterhawks. The Winterhawks won that series in five games. The Rockets played back-to-back regular season games in Oregon State last season. On December 31st the Rockets were a 9-3 winner and then rang in the New Year with a 7-2 victory. In Kelowna, the Rockets skated to 6-2 and 6-3 wins. Overall in those four regular season games the Rockets out-scored the Winterhawks 28-10. Following tonight’s game the two teams meet on Saturday night at the Moda Center. Two games are scheduled back at Prospera Place when the Winterhawks pay a visit on November 21st and 22nd to close out the seasonal series. Following these two games in Portland, the Rockets are in Vancouver on Sunday before hosting the Victoria Royals on November 5th. The Rockets open a stretch of games playing 8 of their next 11 on the road. Rockets pick up goalie: The Rockets have added 18 year-old goaltender Michael Herringer to the roster. Herringer was listed by the Rockets a few weeks ago after being released by the Saskatoon Blades. 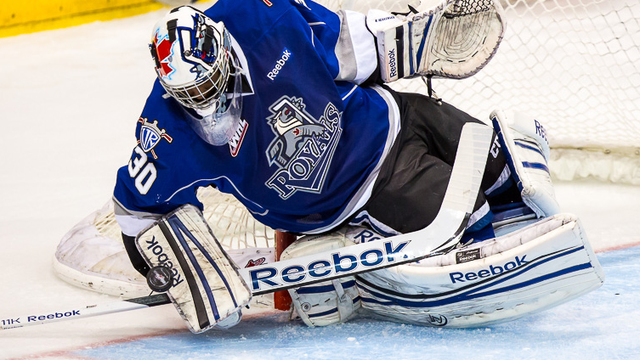 The Blades obtained the Haitian born goalie in a trade with Victoria back in September. The Comox, BC resident was originally drafted by the Royals in the 9th round of the 2011 WHL draft. Do you remember? The Winterhawks were 25-8-2-2 when the Rockets met them down in Portland for back-to-back regular season games last season. Portland was also without three top players in Brendan Leipsic, Nic Petan and Derek Pouliot. All three were playing for Canada at the World Junior Hockey Championship. Kelowna Rockets GM Bruce Hamilton was a member of the management committee for Team Canada. By the numbers: Nick Merkley has 10 points 1+9=10 in his last six games…Madison Bowey has 7 points (4+3=7) in his last six games…Tyson Baillie hasn’t scored in five games. Baillie started the season with 7 goals in his first five games…Madison Bowey is 3 goals shy of 50 for their career…Rourke Chartier is 4 goals shy of 50 for his career…..Riley Stadel is 4 penalty minutes shy of 100 for his career…Austin Glover leads the team with a +14 rating…Justin Kirkland is 8 games shy of 100 for his career…Tyrell Goulbourne is 10 penalty minutes shy of 400….Jackson Whistle has 6 career shutouts. Bowey/Baillie represents WHL: Captain Madison Bowey and 19 year-old forward Tyson Baillie will represent the Western Hockey League in the Subway Super Series in November. Games against the Russian Selects will take place in Saskatoon November 10th and in Brandon November 11th. This and That: Nick Merkley leads the WHL with 12 power play assists… The Kelowna Rockets are rated as the top team in this week’s CHL Top 10 junior rankings. This is the fourth consecutive time they have been rated #1….Jackson Whistle is the CHL Goaltender of the Week. The 19 year-old earned back-to-back victories last week over Tri City and Brandon while posting a goals against average of 0.50. Whistle earned a shutout over that period with a 4-0 win over the Tri City Americans….You will notice a change behind the Kelowna Rockets bench tonight against the Winterhawks. Head Coach Dan Lambert is coaching one of three Canadian entries at the Under 17 World Hockey Challenge in Sarnia/Lambton Ontario. Assistant Coach Kris Mallette will gun for his first career WHL coaching victory this evening and fellow assistant Travis Crickard will be helping guide the team for the next six games until Lambert returns November 11th against Spokane….The Rockets are an incredible 122-28-3-5 in their last 158 regular season games dating back to the start of the 2012-2013 season….The Rockets have scored seven shorthanded goals this season. Last season the team managed 13 shorthanded goals and had the best penalty killing unit in the WHL…Colton Heffley played in his 250th career WHL game October 7th against the Swift Current Broncos…. The Rockets have scored a power play goal in ten of 13 games this season…The opposition has opened the scoring in eight of the thirteen games….The Rockets have out-shot the opposition in ten of the thirteen games this season…Austin Glover has points in five of his last seven games. Glover has 4+3=7 over that stretch. Glover has points in eight of the 12 games he has played in this season…Nick Merkley has been held pointless only twice this season. It is safe to say, Michael Herringer is the first Kelowna Rockets player born in Haiti. The 18 year-old goaltender, who moved from Haiti to Comox B.C when he was two, has joined the team after Jake Morrissey was hurt in practice this week. "I have long legs, so that helps. Staying square to the shooter. I like to use my body to get in front of pucks. Sometimes I am not afraid to go outside of my technique to make a save". The 6'2, 185 pound goaltender was originally selected in the 2011 Western Hockey League bantam draft, in the 9th round by the Victoria Royals before eventually being traded to the Saskatoon Blades in September of this year. The Blades dropped Herringer and the Rockets added him to their protected list about two weeks ago. "Everybody tries to be like Carey Price but I try to watch a little bit of every goalie in the NHL. They are all there for a reason, so you can learn something from everybody." Herringer will join the Rockets when they open a three game road trip Thursday in Portland. 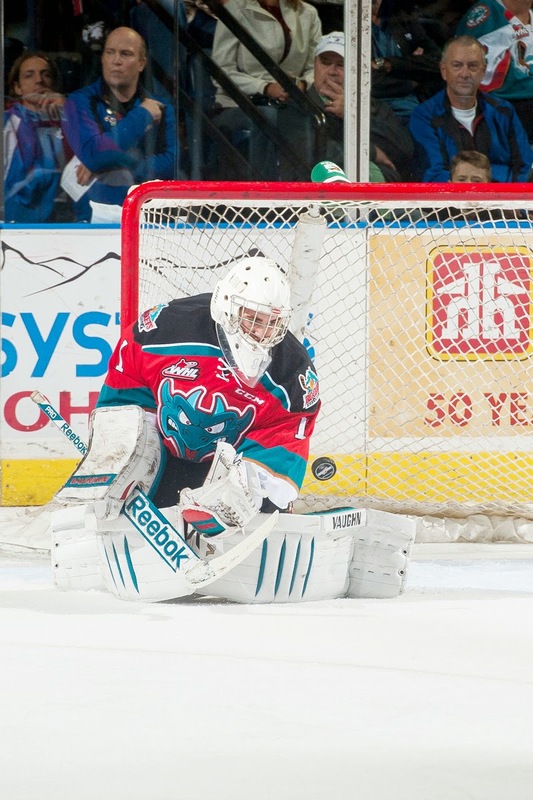 An injury to back up goaltender Jake Morrissey has forced the Kelowna Rockets to find an emergency replacement. The team has brought in 18 year-old Michael Herringer. Herringer was originally drafted by the Victoria Royals before being traded to the Saskatoon Blades in September. Herringer was listed by the Rockets two weeks ago. Herringer, who is from Comox BC, will back up Jackson Whistle Thursday night in Portland. Let’s be real here. As great as Saturday’s game was between the Kelowna Rockets and Brandon Wheat Kings, it was a one off. Sadly, this just doesn’t happen where a team, specifically from the Eastern Division, trots into Kelowna with a high powered squad. The division, which is often weaker than its Central Division counterparts, usually come into Kelowna with no fan fare at all. No one really cares.The statistics don’t lie. The last Eastern Division team to win the league title was Brandon in 1996. That was 18 years ago! While some are calling for more than one game between an Eastern Division team and a Western Conference foe after what we witnessed Saturday, one game a season is about right. It’s always better for the paying public to be wanting more than force feeding them with a handful of games against Moose Jaw and Prince Albert. I am sure the feeling is mutual. I am not making this up. One soccer mom, while I was attending my my son's soccer tryouts Saturday morning, asked me where Brandon was located. Really? Just think, the Brandon Wheat Kings are still a year away of being where they want to be as a power house, not only within the Eastern Conference, but the entire league. The Wheat Kings are younger than the Rockets with a good contingent of its players, including its top goaltender just 18 years of age. Typically, a team loaded with 19 year old's eat at the banquet table in the championship series in May. Without a doubt Saturday's game was Jackson Whistle’s best in a Rockets uniform. The 19 year-old was lights out good. If you couldn't see it, you can now, on why NHL scouts like to draft big goalies. Whistle’s size does matter. Not as technically sound as someone smaller, when Whistle comes out of his net to challenge the shooter there just isn’t a lot to shoot at outside of his chest or pads. Why do the Wheat Kings have so much success in making trades? 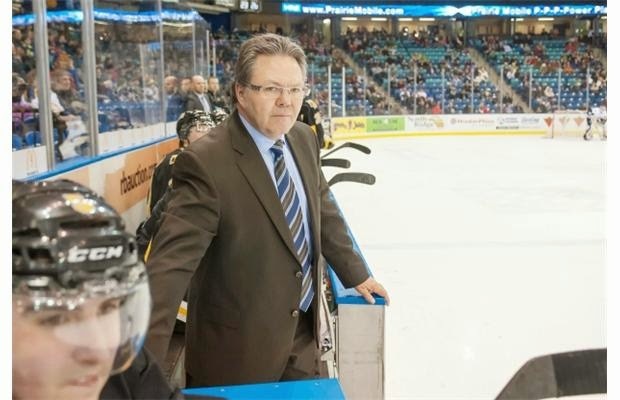 My belief is because Kelly McCrimmon holds both the general manager and head coaching role. McCrimmon has an advantage over those teams that choose to split the duties. For my money McCrimmon can make calculated trades because he knows his and the opponents players better. "I think the advantage is you know your own players better if you are coaching and managing rather than just coaching. You also have a better feel at ice level of the players on the opposition you like and the impact they make in a game when you are standing on the bench,” McCrimmon told me Saturday. Bingo!! Being politically correct is applauded these days but that didn’t stop Kamloops Blazers head coach Don Hay from naming names after a home ice loss Friday night to the Wheat Kings. Hay said two players had to be better for his team to compete against a juggernaut like Brandon. I liked it. I thought it was refreshingly honest. Do we as a fan base want to be lied too by the coach? All I know is the next night the Blazers bused to Tri City and beat the Americans 2-0. One of the players Hay 'called out' scored a goal in the victory. Hmm. I mentioned a few days ago how Rockets forward Tyrell Goulbourne pointed to the Canadian flag after scoring his first goal Tuesday night in a win over Tri City. After speaking to Goulbourne, he mentioned that he was pointing to the heavens in tribute to his brother, who died when Goulbourne was just 13. It was a nice expression by the Rockets forward, whose brothers’ memory will always be in his heart. Goulbourne is off to a nice start offensively, but the 20 year-old says he has to remember what makes him affective. “That’s what I am supposed to be doing on that line. Mid-lane driving. I have to use my speed through the middle. Honestly, he (Nick Merkley) deserves all the credit. He is finding me wherever I am”. For those who thought Damon Severson would have 7 points in 8 games, please stand up. The Kelowna Rockets defenceman of the year last season has 4 goals already this season with the New Jersey Devils. Is Severson going to win the Calder trophy as the NHL’s best rookie? Tyler Myers did it with Buffalo in 2010. When the Rockets board the bus and head down to Portland on Wednesday, head coach Dan Lambert will be left behind. Lambert is off to Ontario where he will guide one of three Canadian teams at the World Hockey Challenge. That means assistants Kris Mallette and Travis Crickard will handle the coaching duties and the decisions behind the bench for the next six games. "It would probably be harder leaving the team if we weren't have success. It is great for Kris (Mallette) and Travis (Crickard) to have this experience so I am excited for them," Lambert told me before Saturday's game. To be honest, I was surprised at how flat the Tri City Americans looked Wednesday night in a 4-0 loss at Prospera Place. The Americans looked sharp five days earlier in handing the Rockets their first loss of the season. And that's the key here. The Americans, I assume, were so gunned up to be the first team to beat the high flying Rockets that they were mentally jacked to knock them off the pedestal and it translated into a solid physical effort. 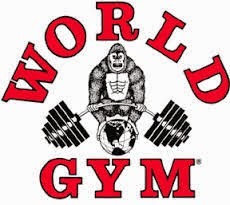 The mind controls the body. The Americans were full marks in the win. While the Rockets don't like to lose, suffering a setback after going ten games without a loss to start the season does take the target off the Rockets back. If it doesn't take the target totally off, it does make it smaller. The Kelowna Rockets and Brandon Wheat Kings haven't made a trade with one another since 2001. Why? "Bruce is pretty unreasonable", Wheat Kings GM/Head Coach Kelly McCrimmon said with a chuckle. "Kelowna, they draft and develop. I think Bruce is firm on what he will and won't do." The best opposing player I saw this week? While his point streak ended at 9 games, 18 year-old Rihards Bukarts is the man! The Latvian is as skilled as they come and he showed it Saturday night with a nice stick handling display in the second period when the Rockets couldn't get the puck off his stick. Bukarts greatest enemy during a brief stop in Kelowna was Jackson Whistle and the goal post. How good was the Rockets kids candy scramble on Saturday night? I have never seen that many sugar hungry kids on the ice at one time for the hugely popular event. What a great crowd Saturday night. With over 58 hundred fans in the seats, it was the largest crowd at a Rockets home this season. Why do other media types in the press box attempt to talk to me when I have my headphones on? I can't hear you!!! Isn't it interesting how both of Kelowna's big sports teams had successful regular seasons but couldn't win the 'big game'? The Rockets won a franchise high 57 games but couldn't get past Portland in the Western Conference final. The Okanagan Sun, Kelowna's junior football team, won 9 of 10 games during the regular season and was riding an 8 game winning streak before losing a heart breaker Sunday in an effort to host the national championship. So, how important is regular season success? Discuss. Jackson Whistle take a bow. In his finest hour as a Kelowna Rockets starting goaltender, the 19 year-old almost single-handedly helped his team to a 6-1 win Saturday night over the Brandon Wheat Kings. Whistle had to come up large in the first 58 seconds of the game when Wheat Kings forward Jesse Gabrielle was awarded a penalty shot. Whistle made massive saves all night long including a point blank chance against Tim McGauley in the second period. When Whistle didn't stop the puck, it rang off the goal post or cross bar no less than four times. Without Whistle's heroics, specifically early in the game, the visitors could have easily have walked away with a 6-1 win. Instead it was the home team that won for the 6th consecutive time on home ice and handed the Wheat Kings only their third loss of the season. Don't let the final score fool you. This was a tight game. Brandon's high octane offense was fun to watch. Scary fun in fact. The Wheat Kings opening power play in the first period made the Rockets look silly. Wheat Kings leading scorer Rihards Bukarts had two tremendous scoring chances on similar setups but was unable to find the back of the net. Out-shot 11-5 in the opening period, the home team was fortunate to be headed to the dressing room in a scoreless tie. The Rockets players knew it too by patting Whistle on the head at periods end. They did it again after the second period and again at games end. What a great response from the 58 hundred fans when they gave Jackson Whistle a standing ovation after making several solid stops during a massive flurry to end the second period. The buzzer sounded and the fans rose to their feet and sent vocal love towards the sweaty goaltender. That is what home ice advantage is all about. As good as the Wheat Kings were early, you could see the Rockets finding their game late in the second period and obviously in a four goal third period. My belief is the speed/tempo of the game is something the Rockets haven't seen since last years Western Conference final against the Portland Winterhawks. Moving the puck quickly and making good decisions with it are pivotal against teams like Brandon, who thrive on capitalizing on the other teams turnovers. Once they reached the same tempo as the Wheat King, the Rockets found more time in the offensive zone and forced them to play defense. Nick Merkley's shorthanded goal was unbelievable. The 17 year-old worked away from a Wheat Kings defenceman and at the last second poked the puck past Brandon goaltender Jordan Papirny who was moving to his right. Merkley's goal made the score 3-1. If the Wheat Kings score its a 2-2 game. Merkley ended the night with a goal and three assists. For my money he was the best Rockets forward on the ice. Madison Bowey scored twice in the win. Both of those goals came on the power play with solid slap shots from the blue line with good traffic in front of Wheat Kings goaltender Jordan Papirny. I am not sure if the 19 year-old has the hardest shot in the league, but it has to be close. One thing I do know, it sure is accurate. Cole Martin scored a power play goal. It was a clear sign that things were going right for the Rockets. Martin has never scored a power play goal in his career. Martin reached his career high of two goals set back in the 2012-2013 season. The Wheat Kings are going to win a lot of games this season. They are scary good. With lots of depth and good goaltending, I can't see why a 50 win season is out of the question. They are the best Eastern Division representative I've seen in years. The East Division has had some good teams but no where near this top end. The power, typically in the Conference, has been held by Edmonton and Calgary for what feels like years. Brandon GM/Head Coach Kelly McCrimmon wouldn't have liked the result but surely can't feel bad about the effort of his team. Clearly they didn't receive one favorable bounce in the game. They had to earn everything they got. They ran into a hot goaltender too. It happens over the course of a 72 game schedule. The Rockets will feel the wrath too. No one is exempt. I thought it was awfully classy of Kelly McCrimmon to stop by our broadcast booth after the game and shake hands with myself and colour commentator Gord McGarva. 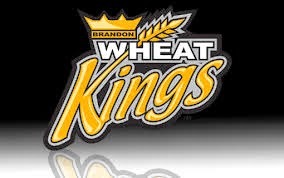 It is a shame we don't see the Wheat Kings but more than once a season. I sure wouldn't mind making a trip out East to Brandon in late April, but as a wise man once said, much can happen between now and then. Tonight’s Preview: It is arguably the marquee matchup in the WHL as the Kelowna Rockets host the Brandon Wheat Kings. These two teams are suggested by many to be contenders for a league title this season. Unfortunately, this is the one and only meetings between the two this season. In 2013-2014, in Brandon, the Rockets rallied for a 6-5 overtime win. In that game on December 13, 2013, the Wheat Kings had a comfortable 5-3 lead with under a minute left in regulation time. Ryan Olsen would score with 38 second left before Myles Bell tied the game with 9 seconds remaining in regulation time. Bell would then score the game winner at 2:52 of overtime. The Wheat Kings last appearance in Kelowna was back on October 20, 2012. Jordon Cooke made 27 saves in the Rockets 4-2 win. Following tonight’s game the Rockets are back on the road for three straight games next week against Portland (twice-Thursday & Saturday) and Vancouver (Sunday). The next home game is November 5th against Victoria. Get up and go ‘Goulby’: Tyrell Goulbourne has 4 goals and 2 assists in five games this season. Last season Goulbourne didn’t score a goal until his 9th game of the year. In fact, it took 24 games before the now 19 year-old scored his 4th goal of the season. Goulbourne scored a career high 17 times last season. By the numbers: Nick Merkley registered his 50th career assist Wednesday night….Rourke Chartier and Madison Bowey are both 5 goals shy of 50 for their career…Riley Stadel is 4 penalty minutes shy of 100 for his career…Austin Glover is tied for the league lead with a +/- of +13…Justin Kirkland is 9 games shy of 100 for his career…Tyrell Goulbourne is 10 penalty minutes shy of 400….Dalton Yorke played in his 50th career game last Friday in Spokane…Jackson Whistle has 5 career shutouts. This and That: Did you know that Damon Severson, the Rockets defenceman of the year in 2013-2014, was born in Brandon? You do now. Severson is now playing with the NHL’s New Jersey Devils….This is Dan Lambert’s last game behind the bench for the Rockets. What? Don’t get too excited, but Lambert will be leaving the team where he will coach one of three Canadian entries at the Under 17 World Hockey Challenge in Sarnia/Lambton Ontario. Assistant Coach Kris Mallette will gun for his first career WHL coaching victory this Thursday in Portland. Mallette and fellow assistant Travis Crickard will be guiding the team for the next six games until Lambert returns November 11th against Spokane….The Brandon Wheat Kings and Kelowna Rockets don’t make many trades with one another, but when they do they are significant. 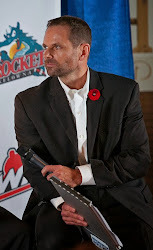 An example was in 1999 when the Rockets sent 20 year-old Brett McLean to the Wheat Kings for 20 year-old Ryan Johnston, 19 year-old Adam Kaminsky and future considerations. Jan Fadry was acquired from the Wheat Kings on October 12, 2000 along with Bart Rushmer for hulking defenceman Nolan Yonkman and future considerations. Fadrny would score 32 goals and would collect 77 points for the Rockets that season. ….The Rockets are an incredible 121-28-3-5 in their last 157 regular season games dating back to the start of the 2012-2013 season….The Rockets have scored five shorthanded goals this season. Last season the team managed 13 shorthanded goals and had the best penalty killing unit in the WHL…Colton Heffley played in his 250th career WHL game October 7th against the Swift Current Broncos…. The Rockets have scored a power play goal in nine of 12 games this season…The opposition has opened the scoring in seven of the twelve games….The Rockets have out-shot the opposition in ten of the twelve games this season…Tyson Baillie had a six game goal scoring streak earlier this season. It is the second longest in the WHL…Austin Glover has points in four of his last six games. Glover has 3+3=6 over that stretch. Glover has points in seven of the eleven games he has played in this season…Nick Merkley has been held pointless only twice this season. The 17 year-old failed to hit the score-sheet October 7th against the Swift Current Broncos and was held without a point Saturday in a 5-2 loss in Tri City…Thanks to those who generously donated to the Canadian Breast Cancer Foundation fundraiser at Wednesday’s game. With the sale of unique pink jerseys, pink pucks and t-shirts (sold by Kelowna Firemen), 10 thousand dollars was raised. There is no crying in hockey...or is there? Linaker lights the lamp in OT win!